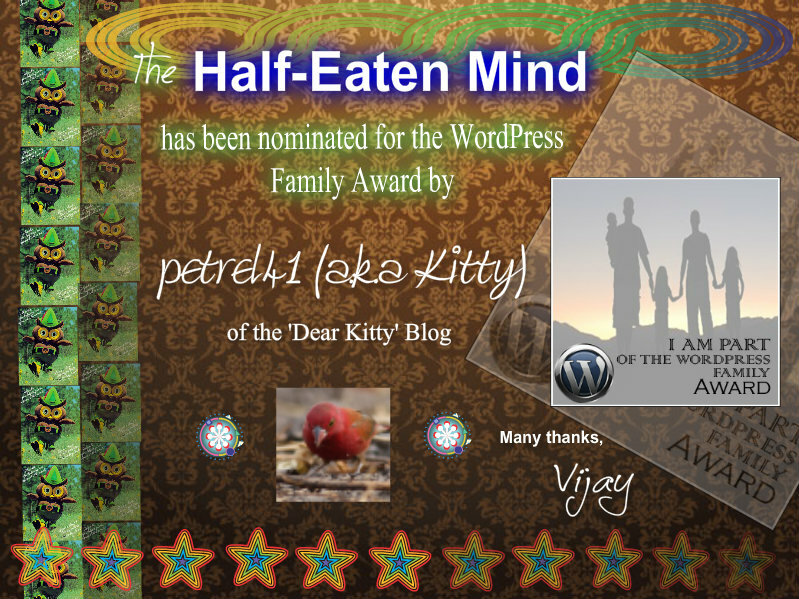 The Half-Eaten Mind has been nominated for the WordPress Family Award by blogger ‘petrel41’ (Kitty) of the ‘Dear Kitty Blog‘ – which writes on all sorts of topics from animals and science to women’s rights and the arts. Though the Half-Eaten Mind has previously being nominated, we are very happy to accept it again from ‘Dear Kitty’. I hope this wil be a many sided diary. I hope I will be able to write much on new discoveries on ancient cultures; new poems; new paintings; new scientific discoveries in medicine, the lives of birds, and much more. In chaos theory, there is the “butterfly effect“: a butterfly in the Amazon rain forest, flapping its wings, usually does not cause a storm far away, felling mighty trees. May there be favourable circumstances for bloggers and others speaking truth to power! “Float like a butterfly, sting like a bee”, as Muhammad Ali used to say. So, dear Kitty, see you again! Since 2005, Dear Kitty now has a platform on WordPress and she has received this award from its creator in recognition of the WordPress family she has built up. 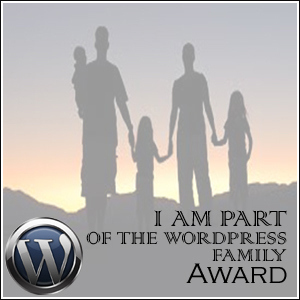 The WordPress Family Award was originally devised by Shaun of the Looking for reasoning to a complicated world Blog who felt that a new peer-to-peer blogging award was needed to celebrate his admittance and acceptance by the WP blogging community. It was his way of thanking them for their acceptance, love and kindness. He expressed awe at how fellow bloggers were very helpful, non-judgemental, always available to answer questions and never making things into a competition. Though Shaun had received many awards in his blogging life, he wanted to make his own as a means of marking his legacy. In honour of the spirit of the WPFA, I have nominated five new members of the HEM community to receive this special award, and in my own small part, thank them for accepting me as one of their own and making the blogging experience a pleasurable, exciting and life-enhancing one. Congratulations to all the winners, and many thanks for being a part of the HEM branch of the WP family. I have also produced a certificate to commemorate the occasion and to add to the awards page. It is not often that I get time to do this, and this was a special effort, but one that was worth every minute spent, particularly as I was a bit late in responding to Kitty’s nomination message. Thank you including my post as a reference! Much appreciated! Thank you so much, Ann. You thoroughly deserve it!! Thank you again and God bless you, Vijay!! I may have already responded this morning,bit this has been a busy day fur us all…. If I responded, thank you again fur your kindness in nominating me! I am one happy kat!! (purrs)! You’re very welcome, Shrimp. I’ve been busy this whole weekend so I can understand…phew..then back to work tomorrow. Tough deal being a human! Yeah… That’s what my human keeps saying. She says I keep her sane…. Whatever that means…. Next Next post: PHOTO MOMENT: From Russia with…cigarette tax stamps!